With spring here and summer around the corner, what could be better than a printable workout designed specifically to help you get tank top arms?!? I love this season’s sleeveless tops and maxi dresses but after a long winter of sweaters and long sleeve blouses my arms could use a little toning. (Truth be told, I’m pretty self conscious about my upper arms so I love exercises that focus on shaping my shoulders and triceps.) Add this workout into your regular cardio routine or some lower body strength work (like the Perfect 10 Lean Legs Workout:). All you need is a pair of dumbbells, and you’ll be sporting fabulous toned arms in your favorite outfit this spring and summer! I usually save my abdominal workout at the end of my workout, and I always love to have a printable plan to ensure I actually get my core work done. I love to mix crunches with isometic plank work since it keeps my muscles guessing through the entire workout giving me more bang for my buck. You’ll work all the abdominal and oblique muscles so add this to the end of a cardio session or onto a strength workout to get a totally toned core! My philosophy on ab work is once it burns do ten more reps…so after you conquer making it through this “fABtastic” workout once try for two or three total times through to keep it challenging:) Remember to go slowly, focus on form and keeps those abs contracted! 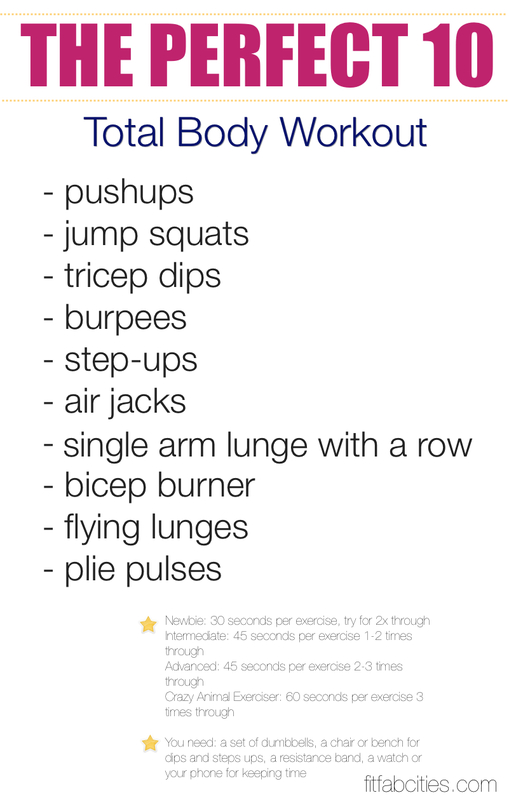 You can print the workout with descriptions plus beginner and advanced modifications here 4×4 workout. Drink lots of water and have fun!